Attract food lovers by providing an attractive outlook to your food items. 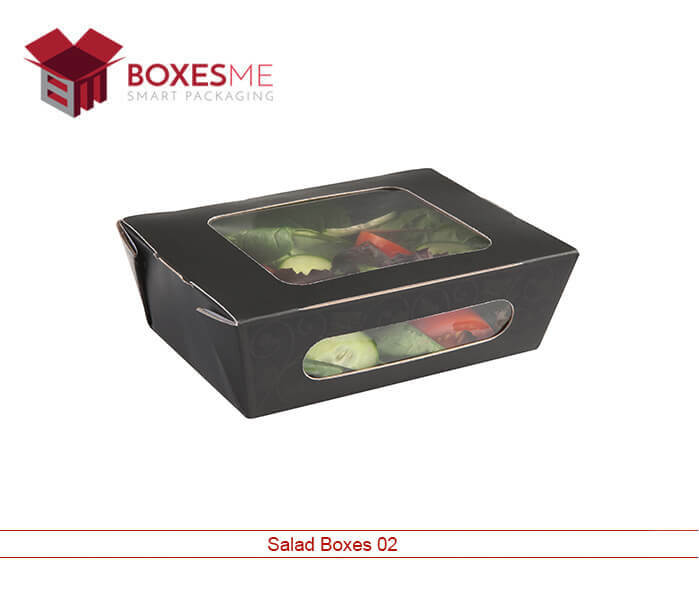 Get your salad packaging boxes with a transparent window on the top of them to crave customers for your product. 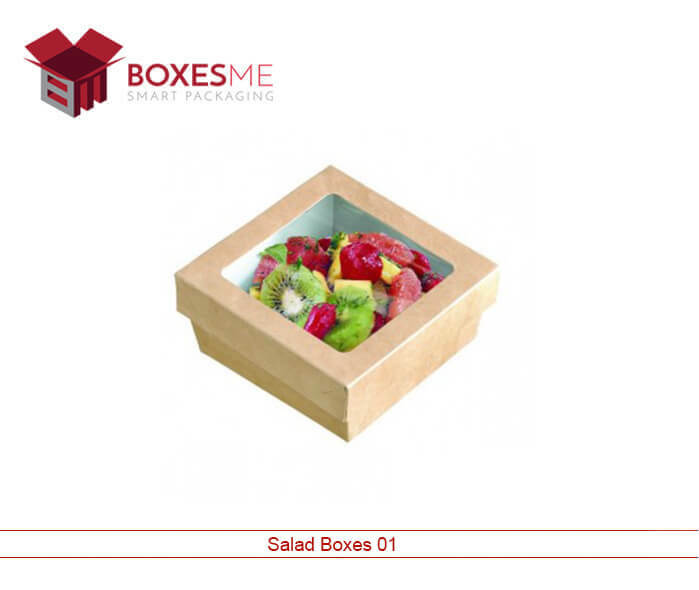 BoxesMe provides plenty of customization options to make your salad boxes catch the eyes of the foodies. Get different printing designs according to the food inside on your small food packaging boxes with window. We are one of the leading Manufacturers & Suppliers of Food Packing Boxes with experienced staff and high-quality services. Our finest quality cardboard preserves your food efficiently for a long time. Whether they are on the go food boxes or special salad packaging boxes with a transparent window, we are expert packaging and printing company in the United States for all your food products. We not only protect your food from contamination but also promote your eatery brand with colorful printing styles and eye-catching design of the boxes. Our retail food packaging can be acquired for taking away boxes as well as for staple food. Get best quality salads packaging boxes with window to stand out from competitors and enhance the sales of your eatables. 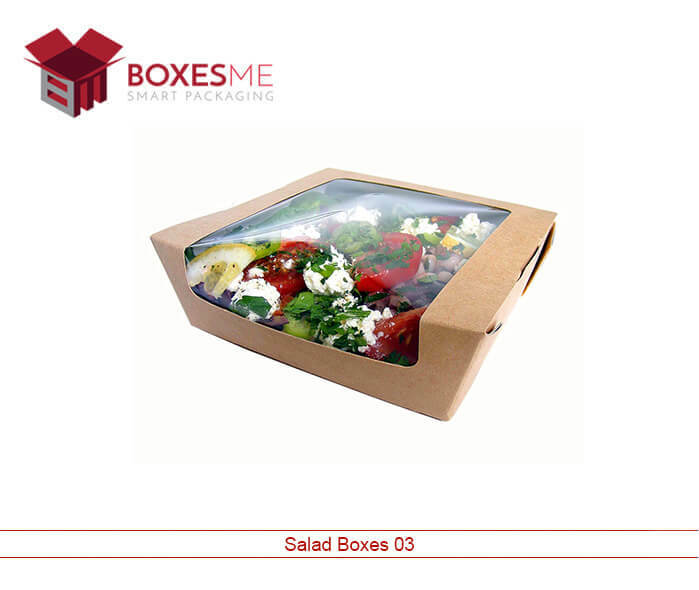 Invite customers to your restaurants by presenting the salad in attractive salad packaging boxes with window. Our top of the line packaging and printing will not only attract customers but also provide them ease of eating their salads. BoxesMe provides you the opportunity to stylize and promote your eatery brand through small food packaging boxes with window. Fruit and vegetarian salads representation has been a trend from recent years, making them more and more attractive is the target of every restaurant owner. We facilitate their food business by offering them custom salad packaging boxes with the transparent window at affordable rates. Get numerous options to glorify the outlook of your salad packaging boxes. PVC window on the die cut patch on the cardboard boxes will allow the customers to see the food before buying without opening the box. We make the boxes tailor-made exactly according to your specifications and demand. We never compromise on the quality of the packaging and make sure each box is made with supreme quality. Getting the right food packaging boxes for food was never so easy for the manufacturers. 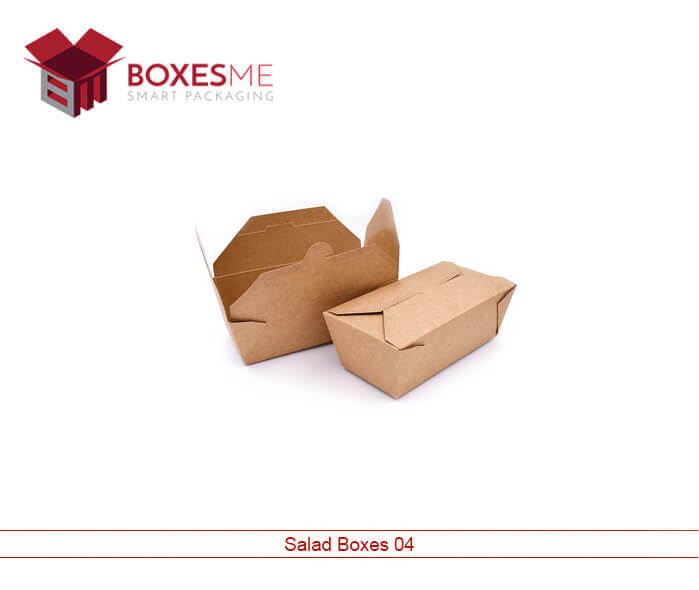 Considering the need, BoxesMe provides take away food boxes made of cardboard and Kraft material to provide a solution to their food packaging needs. We accept short run as well as wholesale orders for the food packaging boxes. Our expert team of designers offers customers a die line template of the pre-made design of boxes to choose. After getting their approval, we start manufacturing the high-quality food packaging boxes and provide free delivery in the United States.